I’ve kept and hatched thousands upon thousands of chameleons, including both rare and common species, so let me guide you through exactly how to keep them successfully in captivity. The single most common common mistake that I see with my chameleon customers is keeping chameleons in glass-sided aquariums. Chameleons need plenty of ventilation—something that doesn’t occur efficiently in a glass tank. Stagnant air can be lethal to a chameleon over the long-term, causing respiratory infections. 16” x 16” x 20” - Suitable for small-sized chameleons, as well as babies. 16” x 16” x 30” - Suitable for small-to-medium sized chameleons. 18” x 18” x 36” - Suitable for medium-sized chameleons. 24” x 24” x 48” - Suitable for medium-to-large sized chameleons. Baby chameleons should not be kept in large cages, so don’t make the mistake of buying an adult enclosure for a new baby thinking that it’ll “grow into” it. This is because babies need to be in close proximity to food—usually fruit flies and tiny crickets. It’s much more difficult for them to come across these miniature prey items in a giant cage. Pygmy chameleons are one species that is an exception to the screened cage recommendation, as they are ground-dwelling and are best kept in glass-sided enclosures with a 2-3 inch substrate of damp cypress mulch or peat moss. Here’s a juvenile Meller’s chameleon we recently imported. This species can make great pets when properly set up. Believe it or not, I don’t recommend using any substrate whatsoever. Let’s say you fill the bottom of the enclosure with dirt, soil, or mulch, and the chameleon attempts to capture a cricket on the floor of the cage. It’s tongue darts out and grabs the cricket—and with it a mouthful of substrate. It’s just not ideal. It can lead to the ingestion of substrate material, and then potential impaction (food items getting stuck in the chameleon’s digestive tract), which can be lethal. Not using substrate also makes cleaning the bottom of the cage really easy, which is a big win for both aesthetics and cleanliness. Enclosure accessories are pretty straightforward. You should install some vines or branches for climbing, and several plants (either live or artificial). That’s it! Ideally, you’ll purchase some artificial vines and stretch them across the enclosure a few times. I generally use short pieces of metal (like sandwich bag twist-ties without the paper wrapping) to affix the vines to the sides of the screened cage. I start at the bottom of the cage and work my way up, using modest sloping—nothing steeper than 45-degrees. You need to make sure the vines or branches reach to within 4-6 inches of the top of the enclosure, so the chameleons can bask under the UV lights. The farther away from the UV bulb, the less powerful the rays. 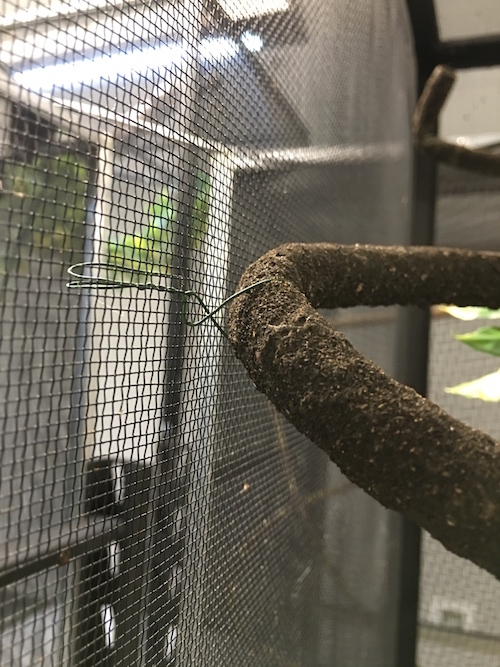 Remember, whatever climbing surfaces you provide, whether they be vines or branches, should be thick enough so that your pet chameleon’s claws don’t overlap. In other words, the tips of their claws shouldn’t be able to touch when grasping a vine or branch. Plants are an integral part of any chameleon cage. There should be enough plant material so that the chameleon can hide and feel secure. Live plants provide added humidity, are natural, and are visually appealing, but artificial plants can also be used, either plastic or silk. Attach the plants in and around the vines, creating a sort of exploratorium for your pet chameleon. sides of each chameleon cage. Another common misconception is understanding how chameleons drink. They do not recognize a water dish as a source of water. They would die of dehydration before they’d realize what was in the dish. This is why foliage is so necessary in your pet chameleon’s cage, as it collects water droplets that your chameleon can drink. You should mist your chameleon’s cage several times per day if possible. Better yet, an automatic mister is a great idea. 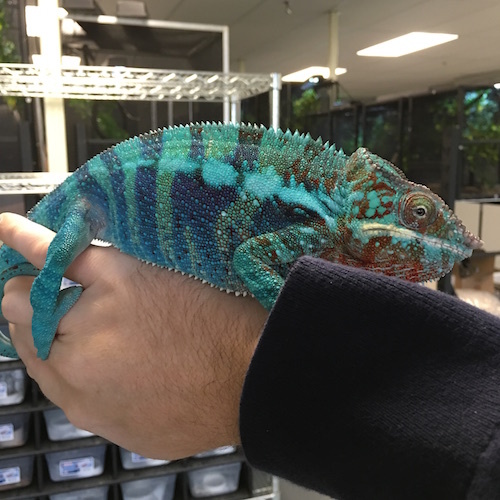 I’ve used almost every type of automatic chameleon mister on the market, and if you’ve just got a few chameleons, I’d recommend the Exo Terra Monsoon (up to eight cages). I wasn’t a huge fan of the Zoo Med ReptiRain. If you’ve got 10+ cages, there are more powerful options available. If you’re looking to save some money, you can just use a plastic dixie cup with a pinhole punched into the bottom and position it so that the water drops land on a leaf. Adjust the hole until the rhythm is about 1-2 drops per second. One breeder named Ron Tremper used to place ice cubes on the tops of the enclosures. As the cubes melted, water naturally dripped into the enclosure. I tried this and it works, but the main reason I stopped is because it’s difficult to direct the droplets. I like to have the drops drip directly onto a leaf or branch. If the drops fall to the floor, they’re of no use. Some folks think the cold water was somehow bad for the chameleons, but I highly doubt it and never saw any detrimental effect. I keep all my chameleons at room temperature, which for my facility means 68F-76F. It’s perfectly fine for the temperatures to drop into the low 60’s at night—some would say it’s even beneficial. Regardless, the point here is that room temperature is ideal. No need for heat mats, infra red bulbs, etc. vines, plants, UVB lighting, no substrate, screen sides. Live plants are best, but artificial is fine. Chameleons do require UV lighting to thrive. After trying several different products, my absolute favorite is the ReptiSun 5.0 UVB fluorescent bulbs. I’ve had great success using them, they don’t burn-out, and it’s the only bulb I have used for years now. UVB lighting allows chameleons to properly absorb calcium, and without it, they will develop metabolic bone disease (MBD) which is fatal. If you live in an area where you can safely and responsibly let your chameleon get some natural sunlight, by all means do so. Just remember that UV rays do not penetrate through glass, so don’t place your pet chameleon by the window and think it’s getting beneficial UV light. Basking bulbs are usually not mandatory, but I use them for almost all my chameleons. Why? Because I’ve found it’s always best to give your pet chameleon options, and let it decide what it wants. Many hobbyists decide what their chameleon needs, rather than giving their pet options and then observing. I place a 65-watt halogen flood bulb on top of each chameleon cage, and then I pay attention to whether or not the chameleon uses the basking spot. I’d estimate that 70% use the basking spot, spanning all types of species. The surface temperature of the basking spot is around 90F-95F. I’ve even seen my montane species basking many times. Chameleons can use heat to their advantage if their body is fighting an infection or sickness, so while they may not regularly use the basking bulb, having it available to them can be an advantage. 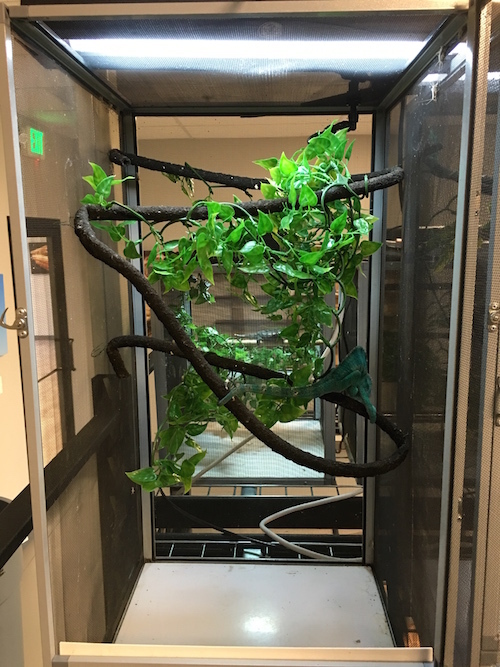 Maintaining humidity in a screened chameleon cage is admittedly a challenge. The reason is that with the added benefit of increased air circulation, you also lose humidity quicker than a solid-sided enclosure. Live plants add humidity, and my favorite safe (ie. non-toxic if eaten) species is the Schefflera arboricola. It’s a very common plant available at Home Depot, Lowe’s, or your local nursery. It’s inexpensive, grows quickly, looks great, and chameleons love it. The branches are thick and ideal for climbing. My second favorite plant for chameleon cages is Ficus benjamina. These also do well inside the enclosure, with mild lighting, but the leaves angle downward and in my opinion aren’t quite as ideal for trapping and holding water droplets for the chameleon to drink. The water tends to run off the leaves quickly. Also, the branches are not very thick, and tend to be more vertical. to a customer recently. They really are living art. Chameleons are not what I’d call reluctant or picky eaters—most are aggressive and opportunistic feeders. But which foods are best? I’ll go into great detail on my “What do chameleons eat” page, but at a high level here’s what you need to know. Simply put, crickets are the most ideal feeder insect, and should be the primary food for your pet chameleon(s). My chameleons are fed a diet that’s comprised of about 90% crickets. I’ve yet to come across a chameleon that refused crickets. The remaining 10% is made up of hornworms and roaches. I like hornworms because they help hydrate newly imported chameleons (which are usually dehydrated), and they’re a nice hydration boost for established chameleons as well. Roaches are savored by many chameleons, and while they’re good at hiding, there aren’t many placed to hide in a screened cage with no substrate. Madagascan chameleons tend to relish roaches more than other species—perhaps because they’re used to eating Madagascar hissing roaches on their home island. 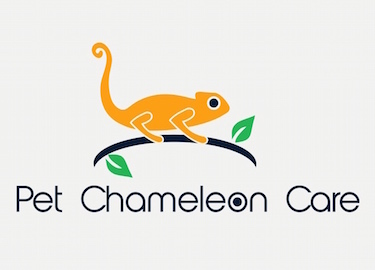 Check out my page “What do chameleons eat” to learn more about specific feeder insects and supplementation. I hope my chameleon care sheet has helped prepare you for your entrance into the wonderful world of pet chameleons. There’s no reason you can’t be successful keeping these incredible creatures now that you’re educated about their needs in captivity. How long do chameleons live? Some chameleons can reach the size of a small cat. Chameleons are the only reptile that chews its food. Chameleons don’t change color based upon their surroundings, it’s actually based upon their mood. Most chameleons lay eggs, but a few species give live birth.